The are different kinds of knives, and each type has it own quirks as far as sharpening is concerned. There are many who think, “a blade is a blade”, but this is not the case. Some knives require different angles to be the most efficient at what they were designed for. There is no single knife that can do it all, and no single sharpening technique that will work for all knives. When sharpening your knives, especially for the first time, you need to consider the type of knife, what style of blade it has, what type of grind (edge), what type of steel, and what it will be used for. 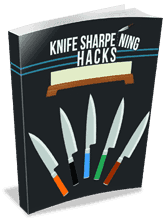 While the focus of this manual will be on kitchen knives, we will discuss the various types of knives because you need to have a complete understanding of cutlery to be able to do a good job sharpening a quality blade. Many kitchen knives will fall into these classifications, because preparing food requires just about all types of cutting there is, at one time or another. You may not have to trim brush in the kitchen, but chopping and cutting frozen meat and veggies is a similar task. Peeling the hide off of a yucca isn’t much different from whittling. We should start by making sure you know what the parts of a knife are, and the importance of each part. The sharp end of the blade that tapers to a point, hence the name. The point can be a Trail Point, Clip Point, Drop Point, Spear Point, Hawksbill Point, or Tanto Point, depending on whether it is above, even with, or below the blades spine. The point is important because it may be needed to start a hole, score something, or hold something in place, or maybe even stab something. If the point is dropped, the top part leading to the point is called the swedge, and if sharpened, is called a false edge. The edge is the actual working part of a knife. Edges can be ground to different profiles, depending on what the knife is intended to be used for. An edge can be Chisel, Hollow-Ground, V, or Flat-Ground, Convex, Compound, or Serrated. Some edges can even have multiple bevels, such as half Hollow-Ground and half Serrated. The edge can be critical, depending on what the knife is used for. Hollow-Ground will give you a very fine, super-sharp edge, but it will be somewhat delicate, and will not stand up to heavy chopping, and batoning (batoning is hammering the blade through something with another object, such as a large stick, or polymer hammer…very hard on edges, and spines…). Hollow-Grinds are found on many fine chefs knives, slicing and boning knives, fillet knives and pocket knives. A ‘V’, or Flat Ground edge will be tough, and is great for chopping and batoning. It will hold an acceptable edge for most tasks, but will not take a super-fine edge for very clean slicing. You’ll see Flat Grinds on Meat Cleavers, Axes and Machetes. Chisel points are used mostly on tools. Convex, and Compound grinds are a compromise between hollow-grinds and Flat grinds. Serrated edges are common on many kitchen knives, and have great shearing power for making clean cuts through tough materials, like seat belts, gristle, and such. Some knives may even have the first half of the blade as a Hollow grind, and the last half of the blade with a Serrated grind. Some people like this combination. The tip is used for delicate cutting. The lower part of the blade, close to the bolster. The back of the blade, or, if it is a double-edged knife, the middle. The spine is the thickest part of the blade, and provides strength to the edge. As a rule, the thicker the spine, the stronger the blade. Spine thickness is also important because it effects the balance of the knife. Blade-heavy knives are great for chopping, but are somewhat unwieldy for delicate slicing. Handle-heavy knives are weak for chopping, but are great for delicate and intricate slicing. Sometimes a spine may have texturing along the last inch or so, near the handle, called “jimping”, which facilitates using the thumb on the back of the blade for extra control when making intricate and very delicate cuts. This is a crosspiece that protects the fingers from opposing blades sliding down your blade on a parry, during a knife-fight, or, in the case of kitchen knives, keeps your hand from sliding down onto the blade if your hand gets slippery. The handle of the knife. Scales can be made from many materials, such as micarta, abalone, turquoise, various kinds of wood, plastic, rubber, leather, and polymers. The design of a handle can effect the ease with which a knife can be used for a specific purpose. A handle can be straight, or have finger grooves. The tang is the unsharpened metal at the end of the blade that the handle attaches to. The tang can be a full-tang, meaning the metal extends all the way to the end of the scales, or a partial tang, meaning the metal only extends part of the way into the scales. Full tang knives allow much more force to be applied to the blade, and are the preferred style for most types of knives. The exception to the rule is folding knives, which by design, are impossible to make with a full-tang. The back end of the knife. For dependable kitchen knives, you want all fixed blade knives. A fixed blade knife is just what the name implies: the blade does not fold. The blade is always exposed, except when it is in its sheath. Fixed blade knives are the tool of choice for people who intend to use their knives hard, such as would be the case for general outdoor knives, field-dressing knives, hunting knives, serious fillet knives, heavy-duty combat knives, dive knives, and yes, kitchen knives. That is not to say there are no folding models of these types of knives available, but serious blade-people will always opt for a fixed blade unless considerations of storage, concealment, or transport are an issue, or the knife will be used for mostly light-duty. Fixed blade knives are a lot stronger than folding knives, and a lot tougher. A fixed blade knife, especially if it is full-tang, is basically a solid piece of steel, with some handle material added for comfort. In fact, some of the most outstanding knives you can buy, such as Cold Steel’s Bushman series, are actually one solid piece of steel, with no handle material to fail. You can wrap the handle portion with paracord if you want, or use it as is.